Because postcards showing houses are rare, we don’t do a lot of our research on these mostly private buildings. Yet we are often asked, “How can I learn the history of my home?” We’ll explain the process as we talk about today’s postcard – and later we’ll tell you how you can start researching your own home. This postcard is a “Real Photo” type from Augustana College Library’s Special Collections. 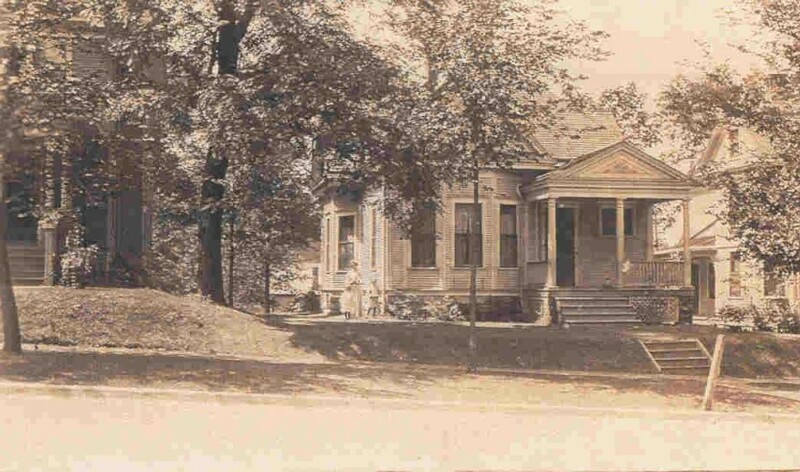 It dates from around 1910 and shows a 1-½ story home that stood at 1030 21st Street. The bay windows and complex roofline mark it as Queen Anne in style, although the front porch with its simple round columns shows a Colonial Revival influence. That combination of styles would suggest an original building date between 1895 and 1905. When we went to see the house today, we were surprised to find a two story duplex at that address. A closer look showed it to be remarkably similar to the house on our postcard. A bit more research and we concluded that the original home is still there – it has just had its roof raised not long after it was first built. Let’s examine the evidence. One of the best sources of information about a building is contained in its abstract. An abstract is simply the history of a piece of land since it came under United States control. However that land history – which usually starts with a hundred or more acres — also contains details of subdivisions, mortgages, liens and wills, which can pinpoint building dates and ownerships. In the past, abstracts were routinely passed on to new property owners. Nowadays, that frequently is not the case. Sometimes abstracts are retained by previous owners, so it’s worth a phone call to them to see if they still have it. More often they end up in an attorney’s office or a bank mortgage department and eventually just disappear. Since no abstract for 1030 21st Street was available, the next step to research was with City Directories. While these directories are available at all local libraries, those at the Rock Island County Historical Society can be viewed as the actual books rather than the more tedious microfilm copies. Since we know the approximate date of the postcard and we have a good estimate of the original construction date of the house, we started looking at 1915 directories and researched forward and backwards from that time. What did we find? The home is first listed in 1901-02, occupied by William Ullemeyer. Mr. Ullemeyer was a pharmacist and part owner of the Hartz and Ullemeyer Drugstore at 301 20th Street. We don’t know if Mr. Ullemeyer was the owner or a renter, as over the next few years different people lived here. Around 1910, William and Katherine Beal took over the home, and probably lived here when the postcard was made. Mr. Beal was a tailor downtown. The directories also showed us that an apartment – 1030 ½ — first appears several years later, with the Beals still living downstairs. Then we crossed our fingers and looked up the year-end editions of the Argus, because we knew they often contain listings of the year’s new construction. This time, we chose to use microfilms rather than the very heavy and cumbrous bound volumes of the original newspapers. We were in luck. In 1916, the Argus reported that contractor Olaf Anderson had done an $1800 remodel for William Beal. Since a large double house was built the same year for under $5000, we feel confident that this remodel raised the roof and built the second story of the Beal’s house. Next we looked at Sanborn Fire Insurance Maps, which are locally available on microfilm at Augustana College. In 1906, there was a single story house on the lot. Sometime before 1935, the home was remodeled to two stories, with the footprint or basic shape of the house remaining the same. These maps also showed that the front porch was widened and a second story porch was added at the same time. Voila—it is the house we see today. Finally, we talked to the current owners who verified that the home’s two apartments were designed from the beginning as separate living spaces and were not just converted from second floor bedrooms. Moreover they noted that the second story apartment shared the same elegance of detailing as the first story; again not typical of a converted use. There is much more research we could have done – we could have searched for more information about the Ullemeyers or the Beals, or even of the Xander family who owned the house for fifty years after the Beals. And perhaps we could have identified the lady and small children standing near the house. But that was outside the scope of this article. This article, by Diane Oestreich, is slightly modified from the original, which appeared in the Rock Island Argus and Moline Dispatch on October 13, 2002.